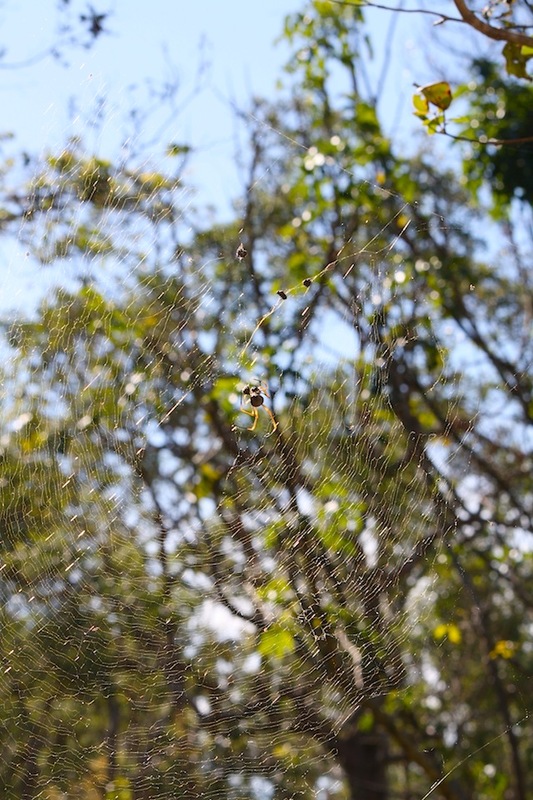 I find myself with three quite different kinds of things to say about golden orb weavers, all inspired by seeing this impressive spider at Wallaman Falls a couple of weeks ago but otherwise unrelated. I will begin with the basic science. 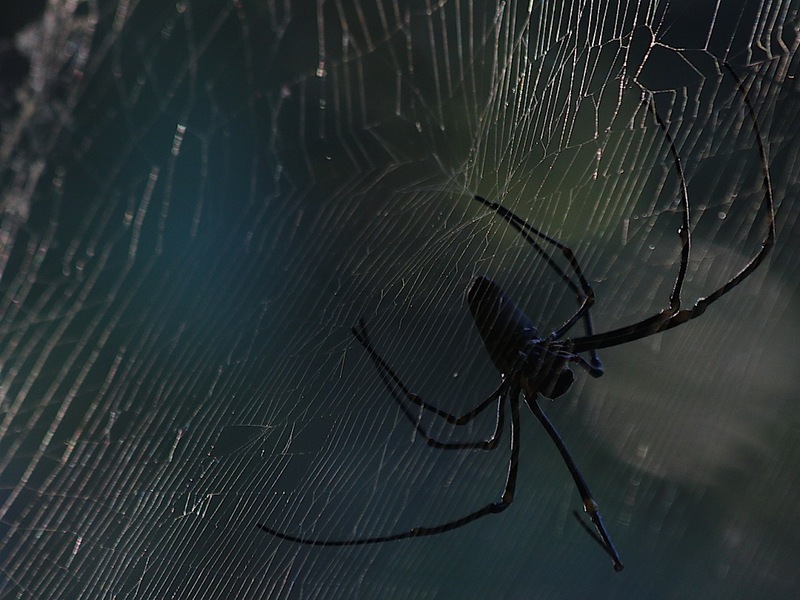 Three species of large Australian spiders are commonly known as “Golden Orb Weavers”. 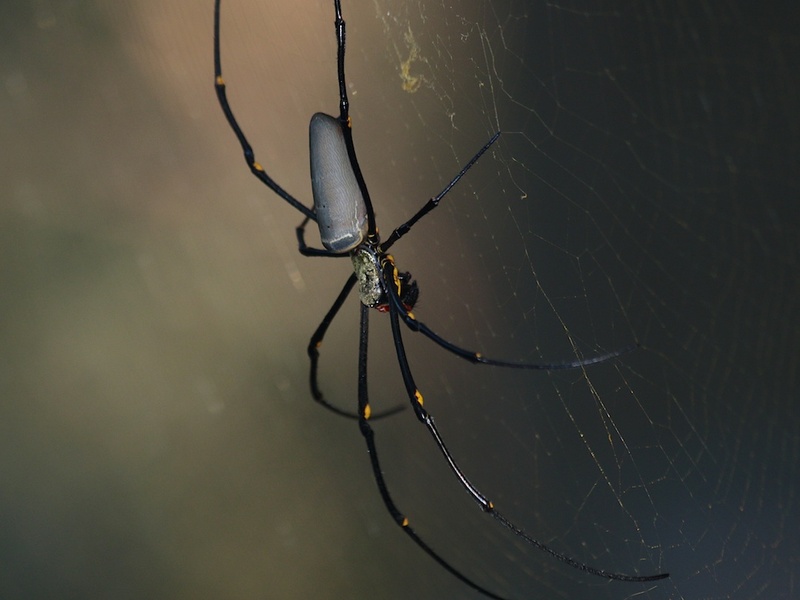 They are all in the same genus, Nephila, and their common name refers to their webs, not their own appearance: they all weave orb webs out of golden silk. This link will take you to full descriptions of all of them on Rob Whyte’s arachne.org but, in brief, Nephila plumipes is the smallest and is found throughout eastern Australia, Nephila edulis is larger and heavier and is common throughout coastal and inland Australia, while Nephila pilipes is longer in the body and legs but slimmer and is a tropical and sub-tropical species. That means all three can be found in tropical Queensland, and in fact I have seen N. plumipes and N. pilipes within twenty metres of each other on Hervey’s Range just outside Townsville. 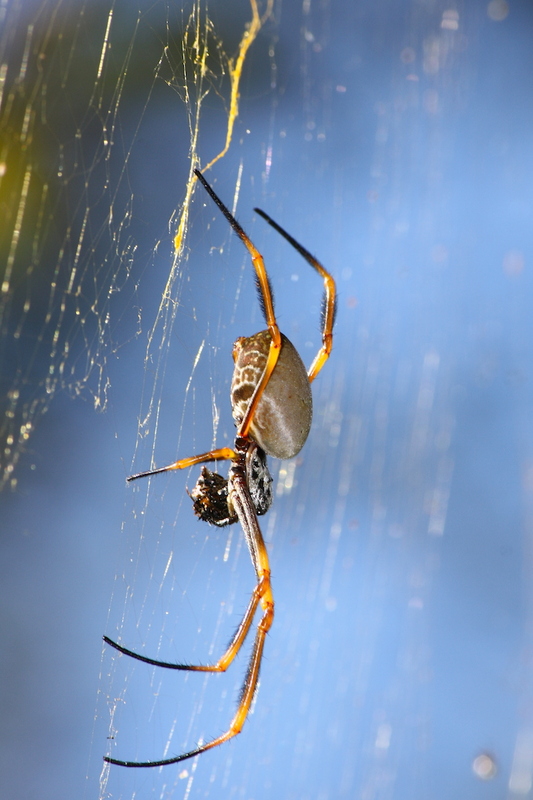 In all three species, the females are far larger than the males, to the extent that the females are the only golden orb weavers most of us ever see. All of them are quite timid and their (very rare) bites are not known to be dangerous. 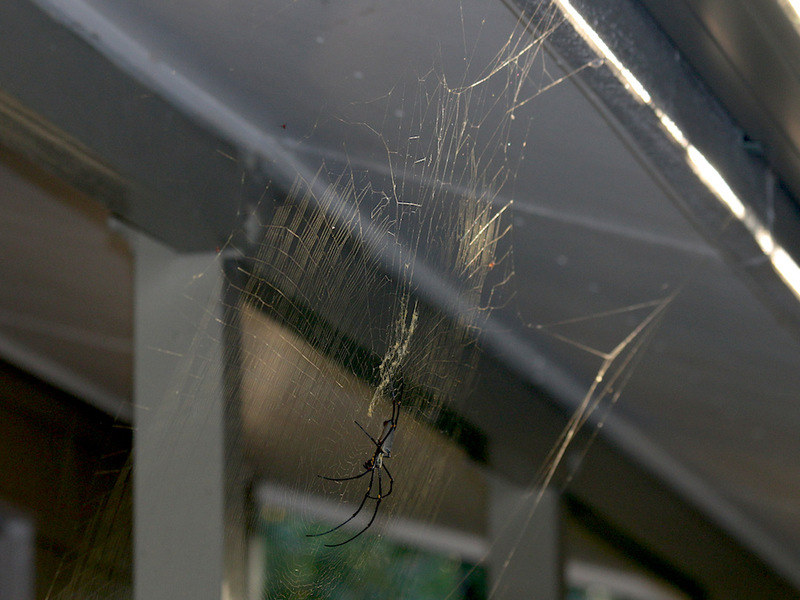 So here we have a female Nephila pilipes in her web in a very public spot (yes, that building is the toilet block, and her web is between the verandah roof and the handrail, right beside the access ramp) at the Wallaman Falls camping ground. How do we see her? Are we learning to love spiders? In my couple of days at Wallaman I spoke to perhaps a dozen people about this spider and I was pleased to find that nearly all of them, after an initial startle reaction, were amazed, intrigued, respectful and even admiring towards her. They were happy to leave her in peace – although some did take care to stay a safe distance away – and happy to learn more about her. “No, she’s not aggressive and not poisonous,” went over well and, “Yes, those little ones are the males,” got a “Wow!” or two. I would love to see all of us display such a positive attitude towards the traditionally scary or ugly creatures around us, and I think we are gradually making progress. And by whose standards are spiders ugly, anyway? I think she’s beautiful. We hear a lot about sexual politics and the imbalance of power but I don’t know that we spend much time thinking about how body size influences the issue. Men and women are comparable in physical size and strength but men are, on average, a bit bigger and stronger so that when push comes to shove (as it does, all too often) men can usually dominate women physically – especially since men, bigger and stronger to begin with, developed their hunting and fighting skills while women focused on the softer arts of rearing children and gardens. That doesn’t mean it’s right, of course, but does go a fair way to explaining traditional power structures. In our industrialised civilisation, of course, physical strength is less and less important, and we are seeing a gradual re-balancing of power which reflects that change. What does this have to do with golden orb weavers? Well, ‘ladies’ like the one featured here have a body length of 50mm and their ‘men’ have a body length of 7mm. (If you can make out three tiny brown blurs on the edges of the web in the first photo, they are the males; if you can’t, here are two photos on arachne.org of N. edulis mating.) Scale that up to human size, and men would be kitten size, chihuahua size. What would that do to our gender politics, I wonder? Can we even imagine a society in which the difference was so big? Would women in pre-industrial societies have kept men as pets? Could men ever achieve legal and moral equality, even in an industrialised society? As adults, the females of both species are grey-brown with wavy markings on the underside of the abdomen. They are both large (as spiders go), although N. edulis at 40mm nose-tail can be twice the size of N. plumipes at 19mm. 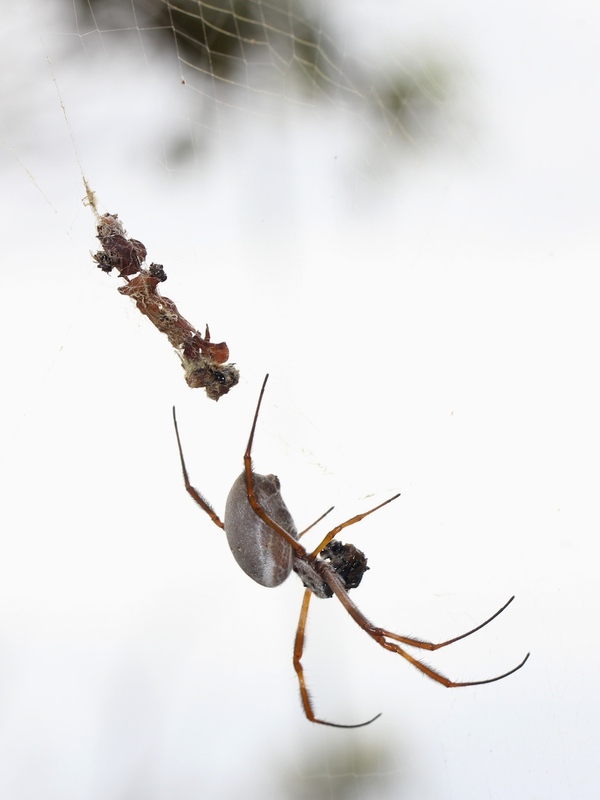 Both tend to leave a messy string of prey debris in their webs. The most positive way of separating them is that N. plumipes has a bright yellow sternum or chest. 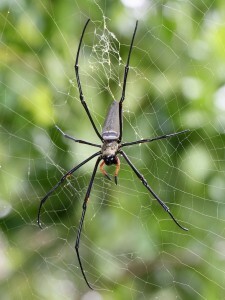 The third species, Nephila pilipes (sometimes known as the Northern or Giant Golden Orb Weaver), is much more recognisable. It is slimmer in the body, its legs are longer in proportion, and from beneath it shows bright yellow knee joints and sternum. Our latest arrivals, who prompted this post but have yet to appear in it, were first spotted on March 30. We lost sight of one three weeks later and the other last week but they were photographed several times before they vanished and will serve to illustrate the rather different colours of juveniles. This one (back/underside) is not much bigger than a St Andrew’s Cross spider and the abdomen is strikingly striped. Six weeks later the yellow highlights underneath are much brighter while the abdomen is almost the adult’s grey-brown on top and the top of the cephalothorax is the adult’s silver. So much for the females. What of the males? Since I have begun linking to other people’s material, here is a fossil Golden Orb Weaver (we now know they have been around for at least 165 million years) and here is Wikipedia’s page which has some pretty off-beat information as well as all the basic facts.